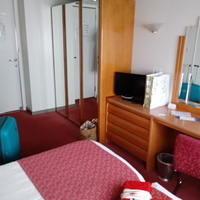 43I booked a last minute 5 night cruise on Marco Polo as it had been advertised at a very good price. I have sailed on her a number of times and have a soft spot for this elegant old cruise ship. Embarkation at Tilbury was very quick, I had allowed for travel holdups that did not occur, and arrived at the port almost two hours early, and checked in and was aboard in less than five minutes. 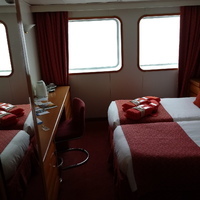 I had a comfortable outside cabin on deck 7 with tea and coffee making facilities, which I was very happy with. 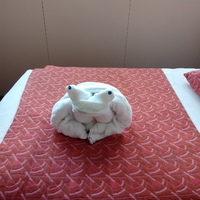 It was kept spotlessly clean by my steward, who was a dab hand at providing me with a range of daily towel sculptured animals. Our first port of call was Rotterdam, which was a delight. Although free coach shuttles had been laid on, it was only a 15 minute walk from the cruise terminal to the city centre. Rotterdam is much more modern than Amsterdam, but the benefit is that you do not have the hordes of tourists to contend with. It is a lovely city to explore on foot. Our next stop was Rouen for an evening visit to the Christmas markets by the cathedral. As before, free shuttle coaches had been provided to the city centre. Rouen is beautiful, I would have liked far longer there to fully explore the place. Our third and final stop was a full day in Honfleur. We had been informed at the start of the cruise that the Christmas market in Honfleur had been delayed and would not be open for our visit. I spent the morning exploring Honfleur, which is well worth a visit, with many quaint narrow streets and ancient buildings. After returning to the ship for lunch, CMV kindly laid on free coaches to take us over the impressive Seine bridge to spend an afternoon in Le Havre. I have seen some reviews of Marco Polo where people moan about various niggles they’ve found, but these seem very unfair to me. The ship is not new, but she is smartly styled and the crew work tirelessly to keep her looking her best. 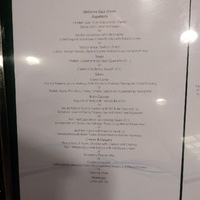 I found the food in the restaurant to be very good, the beef wellington one night particularly worth a mention. Dinner consists of five courses, Cunard only serve four on QM2! My table companions all agreed the food in the restaurant was very good. There were lots of activities organized on board, regular quizzes and games, craft workshops, guest lectures (themed on Joan of Arc, Marie Antoinette and Napoleon Bonaparte which were excellent and well presented) as well as entertainment from talented musicians and an enthusiastic show team of singers and dancers. If you get a chance to do a longer cruise on this lovely liner, you are in for a little treat at the end of your meal on the last formal night. This is possibly the only ship that still does the ‘Baked Alaska’ parade properly. Take your cameras with you to dinner. I’ll say no more so as not to spoil the surprise! The baked Alaska was delicious of course. After a final day at sea, we disembarked in Avonmouth, Bristol. One of a selection of towel 'friends'! Embarkation at Tilbury was very quick, I had allowed for travel holdups that did not occur, and arrived at the port almost two hours early, and checked in and was aboard in less than five minutes. I had a comfortable outside cabin on deck 7 with tea and coffee making facilities, which I was very happy with. It was kept spotlessly clean by my steward, who was a dab hand at providing me with a range of daily towel sculptured animals. Our first port of call was Rotterdam, which was a delight. 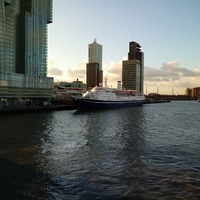 Although free coach shuttles had been laid on, it was only a 15 minute walk from the cruise terminal to the city centre. Rotterdam is much more modern than Amsterdam, but the benefit is that you do not have the hordes of tourists to contend with. It is a lovely city to explore on foot. Our next stop was Rouen for an evening visit to the Christmas markets by the cathedral. As before, free shuttle coaches had been provided to the city centre. Rouen is beautiful, I would have liked far longer there to fully explore the place. Our third and final stop was a full day in Honfleur. We had been informed at the start of the cruise that the Christmas market in Honfleur had been delayed and would not be open for our visit. I spent the morning exploring Honfleur, which is well worth a visit, with many quaint narrow streets and ancient buildings. After returning to the ship for lunch, CMV kindly laid on free coaches to take us over the impressive Seine bridge to spend an afternoon in Le Havre. I have seen some reviews of Marco Polo where people moan about various niggles they’ve found, but these seem very unfair to me. The ship is not new, but she is smartly styled and the crew work tirelessly to keep her looking her best. 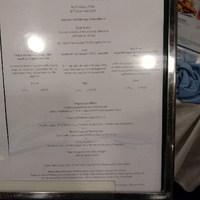 I found the food in the restaurant to be very good, the beef wellington one night particularly worth a mention. Dinner consists of five courses, Cunard only serve four on QM2! My table companions all agreed the food in the restaurant was very good. There were lots of activities organized on board, regular quizzes and games, craft workshops, guest lectures (themed on Joan of Arc, Marie Antoinette and Napoleon Bonaparte which were excellent and well presented) as well as entertainment from talented musicians and an enthusiastic show team of singers and dancers. If you get a chance to do a longer cruise on this lovely liner, you are in for a little treat at the end of your meal on the last formal night. This is possibly the only ship that still does the ‘Baked Alaska’ parade properly. Take your cameras with you to dinner. I’ll say no more so as not to spoil the surprise! The baked Alaska was delicious of course. After a final day at sea, we disembarked in Avonmouth, Bristol. I was allocated a very comfortable cabin on deck 7 with two large windows. Three good sized wardrobes, tea and coffee making facilities. An easy 15 minute walk into the city centre from the cruise terminal. The walk takes you over an impressive bridge. Frequent trams also stop near the cruise terminal. Made use of the free shuttle bus into the city. Only had about two hours here, there is enough to justify a full day in this delightful city.